Below is a photo by Clear Blue Sky of the Winston Churchill statue in Paris. 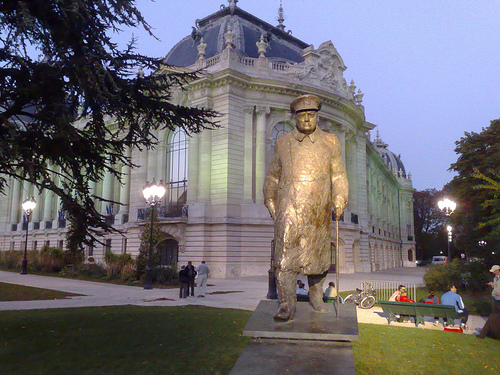 In 1998, it was erected and unveiled just outside the Petit Palais. In bronze and by French sculptor Jean Cardot, it stands ten feet high and weighs about 2.5 tons. Cardot modeled it on a photograph taken on November 11, 1944 of Churchill marching down the nearby Champs Elysees with General Charles de Gaulle.